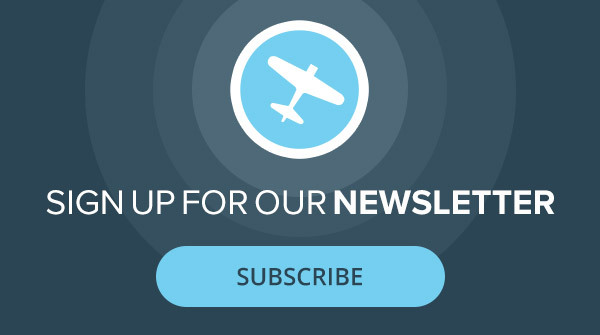 Instrument pilots have a thing for regulatory minutia. An information morsel you’ll often hear repeated is “being able to descend to 100 feet AGL when you can see only the approach lights.” That’s too bad, because it belittles a beautiful piece of information design by turning it into a gouge for aviation trivia night. It’s also wrong much of the time. Section (3) goes on to list nine more things that fall into the general categories of “paint, pavement or lights.” Summing all of this up, it says: You can’t descend below the minimum altitude for the approach unless you’re in a position to land and you have the required visibility and you have one of those 10 references in sight. You need all three—in the U.S., anyway. The approach lights are, however, a great way to measure your visibility as well as bridge the gap between flying on instruments and a well-placed landing flare—if you know what you’re looking at. Approach lights are often the difference between a landing and a missed approach when visibility is low. They accomplish two tasks: orientation and measurement. If the approach is close to minimums, both things happen in a couple of seconds, so it pays to understand everything the lights tell. Read the AIM and it seems like there are 11 different types of approach lighting systems in use, but 10 are variations on one basic theme. In fact, seven of them are versions of the Cadillac of approach light systems: The Approach Light System with Flashers version 2, or ALSF-2. It’s helpful to think about the ALSF-2 as having an inner section and an outer section. The outer section usually consists of 14 rows of five white lights placed every 100 feet, which makes it 1,400 feet long. For an ILS with a glideslope of less than 2.75 degrees, six more rows are added, making the outer section 2,000 feet long. The length matters. At decision altitude (DA), the beginning of the approach light system is often already out of sight under the cowling. On a flatter glideslope, you’ll be further out from the threshold when you reach a standard DA of 200 feet above touchdown zone elevation (TDZE). Without the extra lights, the entire light system would appear too far away—and you’d think you were too low. 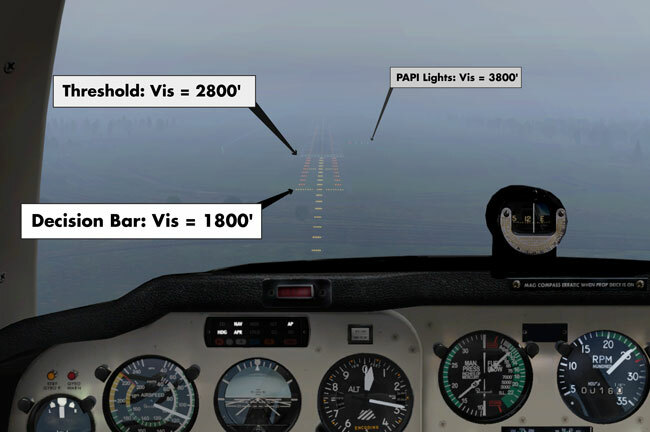 There’s a good chance in low visibility you’ll see the approach lights several seconds before seeing a visual glideslope indicator, such as a PAPI or VASI, because that’s usually 1,000 feet past the threshold. Conversely, reaching DA on an unusually steep glidepath can give the impression that you’re too high. The takeaway is that you shouldn’t change your rate of descent based on lights until you see a PAPI or VASI. In addition to the 14 rows of white lights, the ALSF-2’s outer section contains flashing lights timed for an illusion of a white ball traveling toward the runway twice per second. It both gets your attention—we naturally look to flashing things—and suggests where to look if you want to find a runway. That’s orientation. The inner section of the ALSF-2 starts 1,000 feet out from the threshold with a 100-foot-wide bar of white lights. Sometimes called the “decision bar” or “roll bar,” one of its jobs is helping you align your roll attitude with the actual pavement. Fly a few approaches to minimums because of driving rain, and you’ll understand how those approach lights might emerge from the miasma off one side of the nose and at a roll angle not matching your own. The roll bar gives a bright visual reference as you get everything in alignment. The flashing lights stop at the roll bar, but the center rows of five white lights continue guiding you to the runway centerline and the threshold. Halfway there, 500 feet from the threshold, a short white bar of three lights on each side sticks out. It’s like a mini roll bar. So where are the red terminating bars mentioned in FAR 91.175? They’re on an ALSF-1, which is the same length as an ALSF-2 but has a different inner section. So, here’s more trivia: you could see the red termination bars or the red side-row bars, but never both. Now that you have the big picture, use the accompanying chart as we cut it down. Good weather, low budgets or inconveniently placed shopping malls off the approach end of the runway can mean parts of the ALSF-2 get turned off or never installed. The SSALR and MALSR have the inner section with no side rows and half the lights turned off (so they appear every 200 feet). The outer section only has the solid white lights for 400 feet. The flashing lights still extend the full 1,400 feet, but because they’re all alone for much of that they get a new name: Runaway Alignment Indicator Lights, or RAIL. The SS means a maximum brightness that’s higher than the M. Otherwise, SSALRs and MALSRs are identical. Total length for the SSALR and MALSR, including the RAIL, is 2,400 feet. If the entire outer section system can only be 400 feet long, there’s only room for a few flashing lights, so it’s the SSALF or MALSF. The F is for Flasher where the R is for RAIL. If the airport can’t even afford the flashers, its just steady lights a total of 1,400 feet from the runway called a SSALS or a MALS. 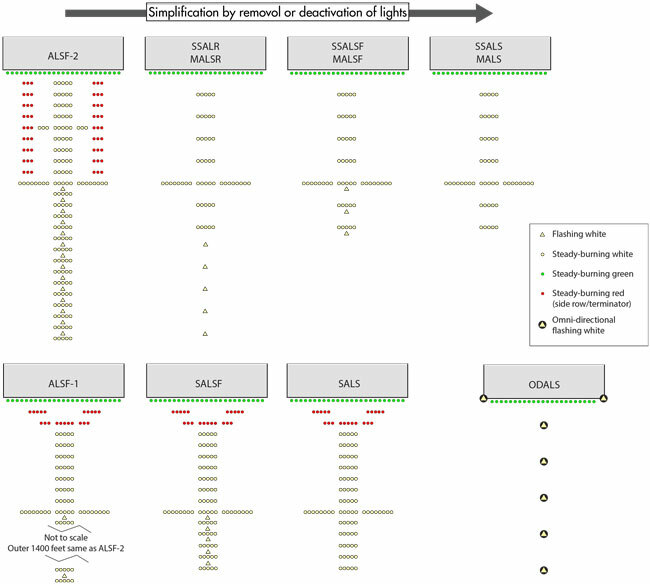 The ALSF-1 can be cut short with or without flashers to a 1,500-foot SALSF or a SALS. One S rather than the SS means it came from an ALSF-1 rather than an ALSF-2. The last option is just 1,500 feet of flashing lights in a T shape called the ODALS. There’s one oddball in every crowd. You can use this light bulb yardstick when you reach minimum altitude on an instrument approach and need to find the runway. If you know what you’re looking for, you know the shape, color, whether it flashes or not, and the length. That length is your measurement for visibility. 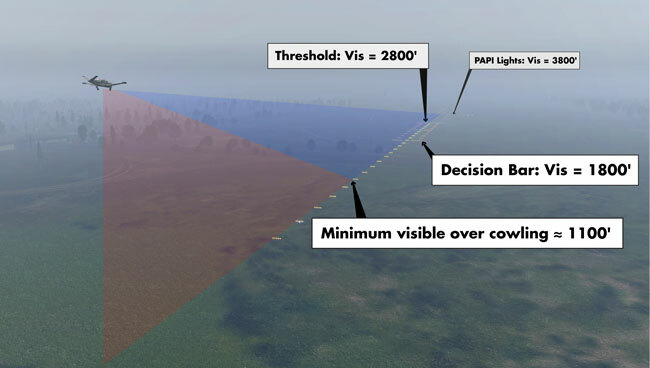 Most Cat-I ILS or LPV approaches require 2,400 feet (half a mile) of visibility. Not surprisingly, any approach requiring less than 3/4-mile must have an ALSF-2, ALSF-1, SSALR or MALSR, all of which are 2,400 feet long. When you reach 200 feet AGL on a standard three-degree glideslope, you’re 2,800 feet from the threshold. If you can see to the far end of the approach light system, you have more than the required 2,400 feet of visibility to continue. If you can only see to the 500-foot barrette, visibility is closer to 2,300 feet. I wouldn’t quibble over 100 feet on the edge of legal. However, I’ll reiterate: Even though the ALSF-2 provides some roll and yaw information, it says nothing about glideslope. The PAPI or VASI is about 1,000 feet beyond the threshold, so fly attitude and resist any pitch changes. With only 2,400 feet of visibility, you probably won’t see a visual glidepath until the roll bar has passed under the nose. If you reach a 200-foot DA and can’t see the roll bar that’s 1,000 feet short of the threshold, you have less than 1,800 feet of visibility. Few ILS approaches, and no LPV approaches, allow visibility that low without special equipment or authorization. Also, if you can’t see past the roll bar, you can’t see “the red terminating bars or the red side row bars” anyway. Therefore, seeing only to the roll bar by DA means missed approach—even though you can see 1,400 feet of approach light system ahead of you. Legally speaking. However, a missed does make it more likely you’ll make it to another trivia night. Knowing what approach lights are associated with which runways can be a huge boon approaching an airport VFR at night. For uncontrolled airports or arrivals after the tower is closed, be sure to check the A/FD to see if lights are pilot controlled. Sometimes that’s via the CTAF frequency; sometimes it’s a special frequency. Know that you can turn the lights up to full brightness and usually activate any flashing lights with seven mic clicks. This sudden burst of brightness in the night is often the best way to find an elusive airport, and if you know which runway has the flashing RAIL, you can better align to the runway. Don’t hesitate to turn those lights down. Full brightness and flashing lights wreak havoc on night vision. Five mic clicks should dim them a bit. Three might dim them further and turn off any RAIL. If the tower is open, you can ask them to turn lights on, off, up or down. Don’t be shy. Finding a runway visually at night in a busy metropolitan area can be tough even with a GPS showing you where it should be. Convincing the tower to change lighting brightness for just a moment can make all the difference.